This page provides a summary of lawyer disqualification law and links to specific topics for further information. Consisting of the two primary parts, disqualification law can appear (deceptively) simple. 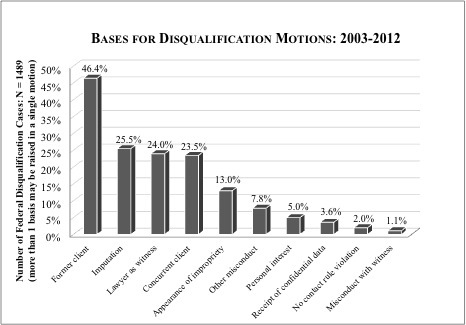 When ruling on a disqualification motion, courts generally (1) look for an ethical violation, or at least the appearance of impropriety, as the basis for disqualification, and (2) if found, weigh various factors to determine whether disqualification is the appropriate remedy in the circumstances. Each part is addressed in order below. (10) the Appearance of Impropriety. (5) Court or Justice System.